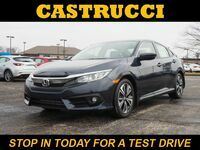 Drivers looking for a small car have a dizzying array of options to choose from, but those looking for a sedan with a roomy interior, attractive styling, and comfortable ride quality will want to keep an eye on the 2017 Honda Civic sedan. So what other features and specifications separate the 2017 Civic from the rest of its competitive class? We’re digging deep to find out, putting the 2017 Civic to the test with a head-to-head comparison against the competing 2017 Toyota Corolla. Interested in learning more? Read on for an in-depth look at the features and specs offered by both the 2017 Civic and 2017 Corolla! 2.0-liter I4: 158 hp; 138 lb.-ft. Engine Specifications 1.8-liter I4: 132 hp; 128 lb.-ft.
15.1 cu. ft. Cargo Volume 13.0 cu. ft. The 2017 Toyota Corolla comes in seven trim levels: L, LE, LE Eco, XLE, SE, 50th Anniversary Special Edition, and XSE. 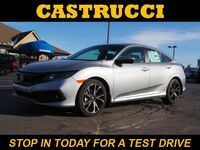 All trims come standard with a 1.8-liter 4-cylinder engine that generates 132 horsepower and 128 pound-feet of torque, which is notably lower than even the 2017 Honda Civic’s base engine option. Standard features include Entune™ Audio, a backup camera, power windows and door locks, a USB port, a 60/40 split fold-down rear seats. All trims also come standard with safety features such as Enhanced Vehicle Stability Control, Traction Control, the Anti-lock Brake System, Electronic Brake-force Distribution, Brake Assist, 3-point safety belts for all seating positions, and the LATCH System. The 2017 Honda Civic sedan comes in five trim levels: LX, CX, EX-T, EX-L, and Touring. 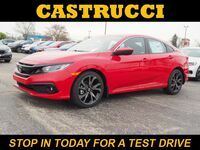 The LX and CX trims come standard with a 2.0-liter inline 4-cylinder engine that generates 158 horsepower, while the EX-T, EX-L and Touring trims come equipped with a 1.5-liter turbocharged inline 4-cylinder that kicks out 174 horsepower. All trims come standard with features such as automatic climate control, power windows and door locks, cruise control, Bluetooth® capability, a touchscreen LCD display, and a rearview camera. All trims also come standard with active safety features such as Vehicle Stability Assist™ with Traction Control, Electronic Brake Distribution, Brake Assist, the Anti-lock Braking System, the Tire Pressure Monitoring System, and LED Daytime Running Lights. 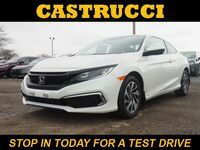 Drivers interested in seeing the features and specifications that set the 2017 Honda Civic sedan apart from competitors in person are encouraged to schedule an obligation-free test drive online or stop in and see us at Matt Castrucci Honda. 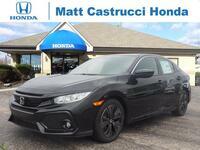 Have additional questions about the 2017 Civic or any of the vehicles in our lineup? If so, feel free to give our team a call today!